I am sitting outside Dipta Krishna Prabhu's house here in Mauritius where broadband Internet is set up. I am happily typing under the big tarp covering a newly gravelled area in front of Srila Gurudev's sitting and meeting room. Rain or shine (and there's plenty of both), the devotees sit here for darshan, with room for more inside. Srila Gurudev Srila Bhakti Sundar Govinda Dev-Goswami Maharaj has a good microphone so everyone can hear very nicely, and Srila Gurudev's effulgent form is beautifully visible even though he sits at the far end of the room. The Prabhus actually cut a big wedge in the wall in front of the doors to facilitate this darshan! The place where Srila Gurudev is staying is the ground floor of the lovely house of Dipta Krishna Prabhu, his wife Purnamasi didi, and their sweet family. The area includes a good, serviceable kitchen for Srila Gurudev's personal seva, Srila Gurudev's room, and two other rooms, all with bathrooms attached, plus a good size sitting room with big French doors that open out to this covered outside area. Right next door is the house of Vinod Krishna Prabhu, the brother of Dipta Krishna Prabhu, his wife Nilanjana Didi and their lovely family. There are two other homes in this little complex, all belonging to members of the same family, and all housing devotees for the festival. Today (Wednesday) Srila Gurudev gave initiation to thirteen new devotees, after giving a most gorgeous talk. I hope to get the CD. Really it was so astonishingly beautiful. Srila Gurudev was so enthusiastic that he said he wanted to go on speaking but said he had his job to do of initiations so he had to stop. Gurudev went out this afternoon for two rounds of the immediate neighbourhood. 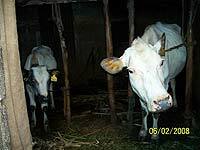 He stopped at the house of Bhakti Bharati Didi and her mother Jnanada Didi and their lovely family, just down the lane from the Temple, and visited their two very fortunate cows. Their front garden is filled with exotic fruit trees. In fact papaya, mango, star fruit, banana, and so many other fruit trees line the roads everywhere you go. Fields of sugar cane rustle in the cooling summer breezes here and the whole environment is made lustrous and blessed by the divine gaze of our Divine Master, Srila Gurudev. Srila Gurudev has been speaking and meeting with devotees almost constantly here. It is such a large community comprising whole families, including uncles, aunts and grandparents. 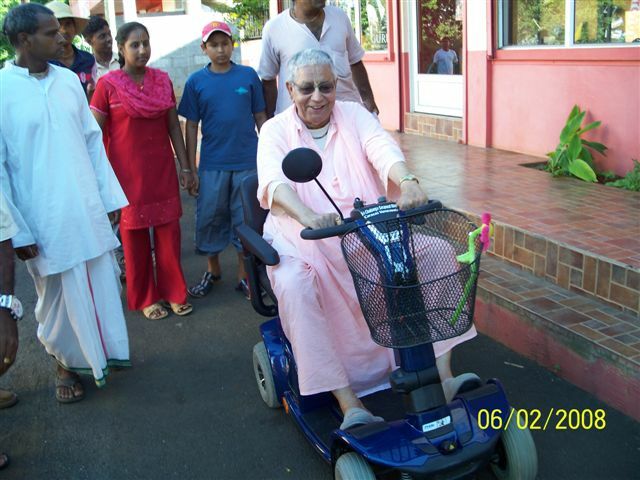 All have much love and affection for Srila Gurudev, and are so well behaved and respectful in their dealings. Often you will see devotees greeting one another with full obeisances, and always addressing one another as Prabhu and Didi. 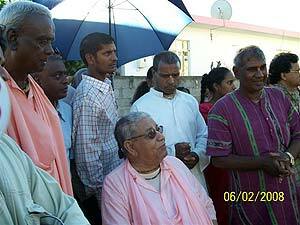 Mauritius has a widely varied population that is nonetheless Hindu in majority. The devotees preach very positively the glories of Srila Gurudev and the message of Sriman Mahaprabhu to chant the Holy Name. Today (Now it's Thursday! I simply could not type out there last night; so many devotees to talk to and meet) will be the opening festival of the Vaishnava Seva Society Ashram. More later!